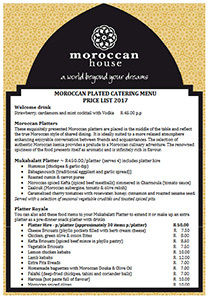 We offer delicious and exquisitely presented Moroccan catering menu options for you to choose from. Our Mukabalatt snack platters are presented on beautiful silver trays garnished with fresh fruit and flowers. There is also a selection of exotic tagine or hearty tangia main courses to choose from. These are presented in traditional hand painted or earthy terracotta tagines and tangias, with burners, ready for heating and serving your guests with no fuss. The Moroccan taste journey is followed by an individual tea glass serving of Moroccan cheesecake with jewels of Turkish delight, and a final bow from this exotic kingdom is with freshly brewed mint tea or Arabic coffee.